According to a report published by the International Union for the Conservation of Nature (IUCN), many of the Caribbean’s coral reefs could vanish in the next 20 years. Data from more than 35,000 surveys suggests that habitats have declined by more than 50% since the 1970s. The report’s authors believe that over-fishing and disease is mainly to blame. They say the trend could continue if nothing is done, but with protection the reefs could bounce back. Carl Gustaf Lundin, director of IUCN’s Global Marine and Polar Programme, said the findings were alarming. “The reefs support a number of different countries and populations,” he said. 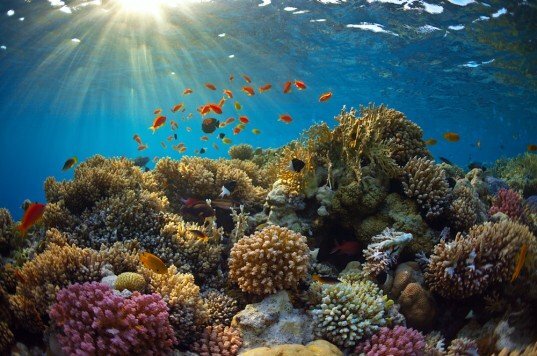 The IUCN report, which was also authored by the Global Coral Reef Monitoring Network, looked at data collected between 1970 and 2012 from 90 reef habitats and is the most comprehensive assessment of corals in this region. The authors concluded that many reefs in the Caribbean were undergoing a dramatic transformation – changing from colorful realms, bursting with life, to barren habitats, covered in slimy algae. They said the damage had been driven by the loss of some of the reefs’ key inhabitants. In the 1980s, a disease, thought to have been brought in from the Panama Canal, wiped out a large number of sea urchins. While fishing on the reefs has also caused parrotfish to plummet. Both of these creatures graze on reefs, and without them, algal species take over. “If we do nothing, I’m afraid the most likely scenario is that we will continue the slippery slope to slime,” Gustaf Lundin said. However, the report concluded that there was evidence that damaged reefs could be revived if they were protected. Conservationists say that warming ocean temperatures are also driving some of the losses. As temperatures rise, corals lose the tiny algae that live in their tissues, causing them to turn white – a process known as coral bleaching. The Caribbean is not the only area that has seen losses to coral reefs. Around the world, these habitats are doing badly.